In January 2006, Governor Schwarzenegger launched the most ambitious rebuilding of California’s infrastructure in half a century. The Strategic Growth Plan (SGP) was designed to restore and expand highways, roads, and transit systems as well as affordable housing, schools, courthouses, ports, levees, and water supply systems. By investing and leveraging billions of dollars in the state’s infrastructure over the next 20 years, the Governor sought to maintain California’s vibrant economic growth, improve the environment, and ensure a high quality of life for generations to come. In November 2006, California voters approved a $42 billion bond package, leveraging an additional $200 billion in federal, local, and private dollars for the largest infrastructure investment in half a century. In July 2008, Governor Schwarzenegger, along with Governor Ed Rendell (D-Penn) and New York Mayor Michael Bloomberg, formed Building America’s Future to bring about a new era of U.S. investment on infrastructure. Governor Schwarzenegger learned during his years in the movie business the importance of global markets and global marketing and took those lessons with him to Sacramento. While Governor, he organized delegations of leaders from California businesses, universities, and local government for multiple foreign trade missions. During his term in office, trade missions were made to Mexico, Canada, China, Japan, Israel, Germany, South Korea, and Russia. In addition to multiple trade missions, the Governor renewed ties with Chile establishing a California-Chile “Partnership for the 21st Century,” and met with leaders at the UN Climate Summit in Copenhagen, France, the United Kingdom and Italy. In April 2004, Governor Schwarzenegger reformed workers’ compensation, saving employers over $70 billion and reducing rates by nearly 65 percent. 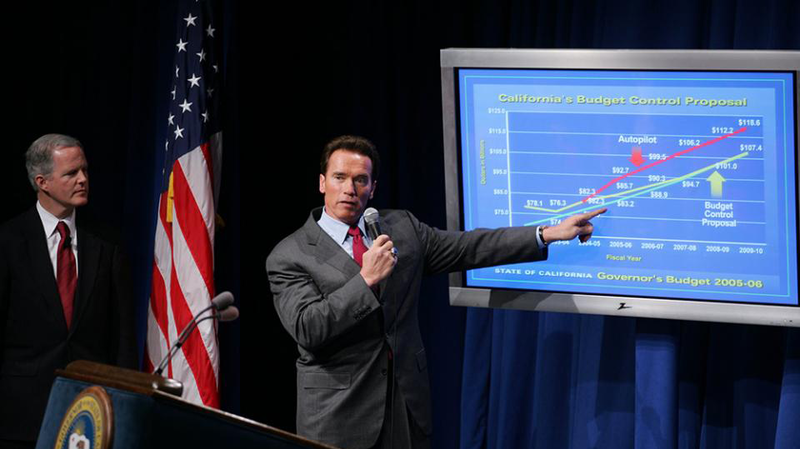 In March 2010, Governor Schwarzenegger signed into law the Green Technology Manufacturing Equipment Sales Tax Exemption, which provides incentives for clean energy companies to come to, or stay in, California. Governor Schwarzenegger supported a film tax credit to address “runaway productions” and support California remaining the film capital of the world. The film tax credit has been allocated to close to 100 projects and protected thousands of jobs. Governor Schwarzenegger championed tax reforms that supported job growth and companies doing business in California, and families purchasing homes in California. Such reforms included the Single Sales Factor; the Small Business Hiring Credit; and the Home Buyers Tax Credit. The Governor negotiated pension reforms with six state employee unions, and as part of his 2010 budget agreement, signed into law across the board pension reform.